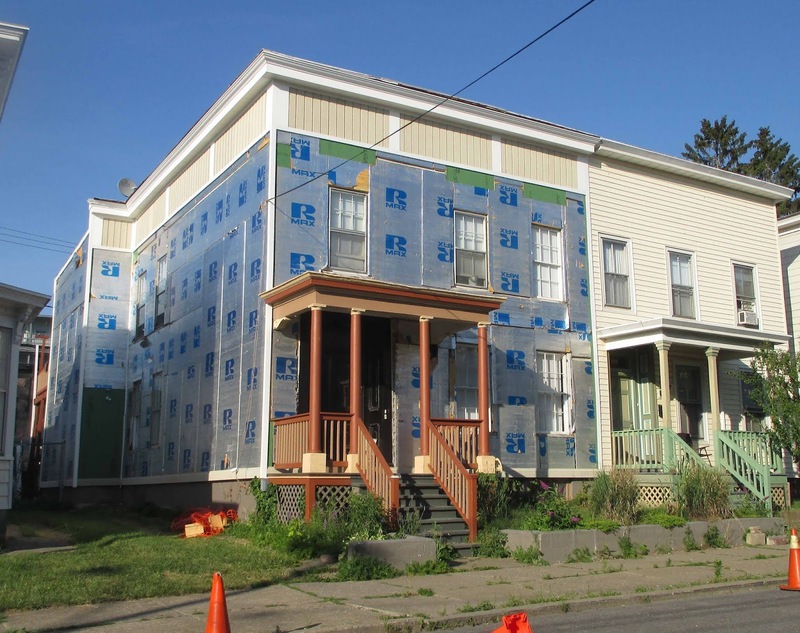 At its June 22 meeting, the Historic Preservation Commission agreed on a new policy. 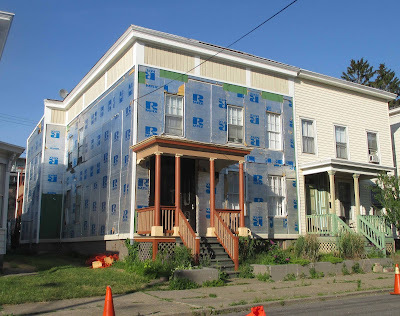 When a project involves the removal of asbestos, aluminum, vinyl, or other non-original siding, a certificate of appropriateness will not be granted to the proposed facade restoration before the siding has been removed. 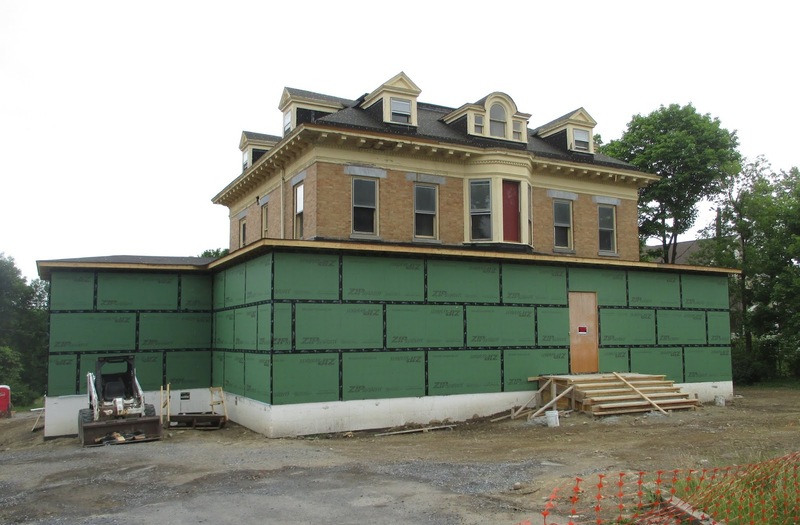 Applicants will be required to return to the HPC after the siding has come off to get a certificate of appropriateness for the facade restoration. This policy is especially important when no historic pictures can be found of the building. Much was covered up when buildings were clad in post-World War II siding, often deliberately to "modernize" the house's appearance, and without a historic photograph, it's impossible to know what lies beneath. It makes no sense approve a plan for restoring a facade without that information. Two recent projects prompted the HPC to adopt this policy. The first is this house in the 500 block of Union Street. 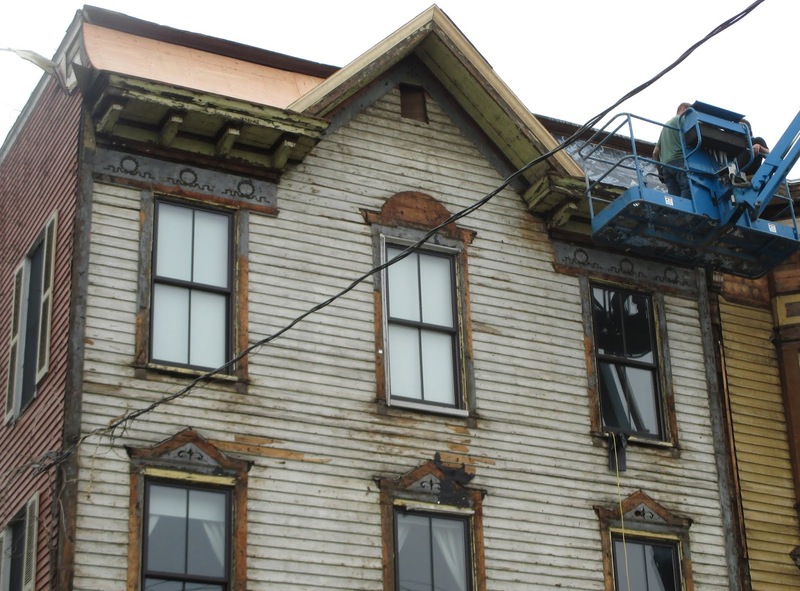 The HPC granted a certificate of appropriateness to remove the vinyl siding and restore the cornice. When the siding came off, three eyebrow windows below the cornice were exposed, but they were covered up again, and since no one knew they were there, the certificate of appropriateness did not specify that the eyebrows should be restored. 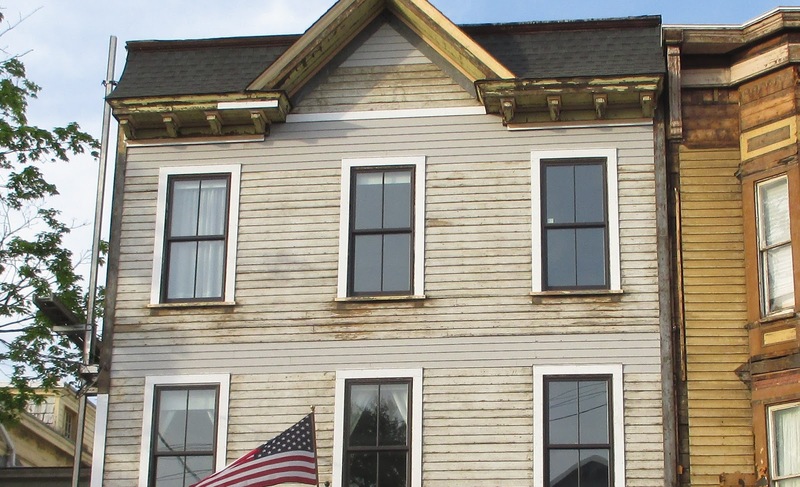 Even without a historic photograph, it seems possible to guess that the original cornice didn't look like what is there now. 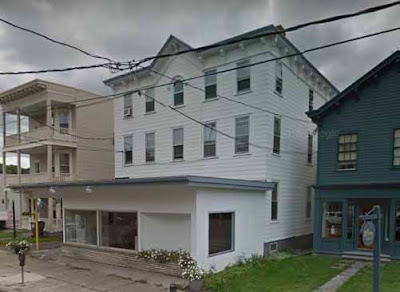 The other project that persuaded the members of the HPC that they shouldn't grant a certificate of appropriateness for facade restoration without knowing what's under the siding is 742 Warren Street. The prospect of 742 and 744 Warren Street being freed from their salmon-colored siding was welcomed with unbridled enthusiasm, and there was even greater elation when the evidence of the buildings' original details was uncovered. But alas, no sooner were the details and the ghosts of details revealed than they were covered up again, and, because the certificate of appropriateness did not make specific reference to retaining historic details that might survive beneath the siding, there was nothing that could be done to prevent it. 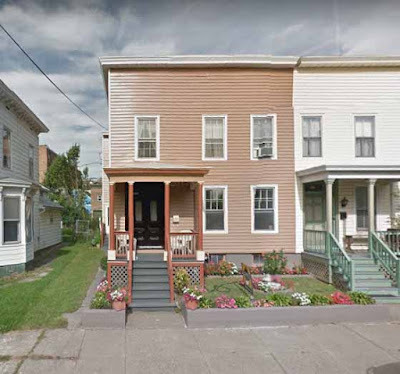 There is no doubt that 742 and 744 Warren Street--two distinct buildings--look much better today than they did clad in siding that made them look like a single building, but imagine how much better 742 Warren Street might have looked with its original details restored. Photographers have often used their art to promote the adoption of shelter dogs. 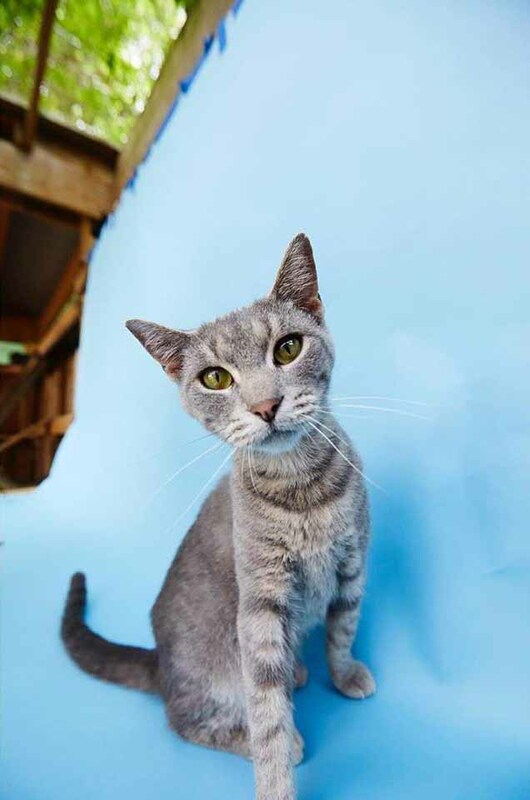 Notable examples are Richard Phipps, who photographed dogs at the Humane Society of New York and created the book Rescue Me; Fred Levy, who started the Black Dogs Project; and Sophie Gamand, who created the series Flower Power, photographing pit bulls in shelters wearing flower crowns. 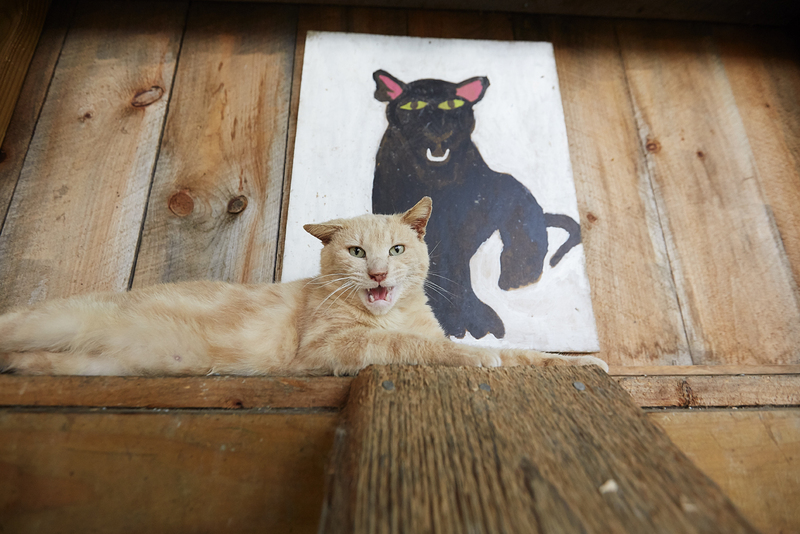 Here in Hudson, photographer Shannon Greer is using his art to encourage the adoption of cats. 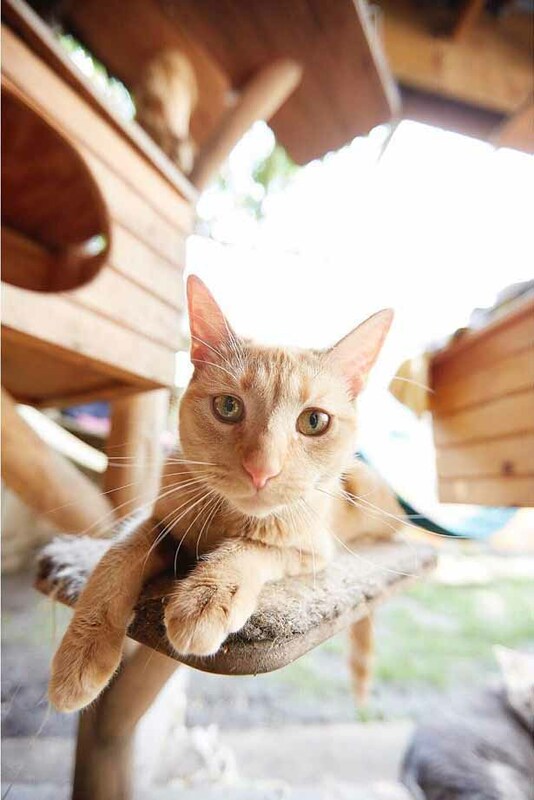 Greer takes amazing pictures of the rescued cats at Animalkind . . .
and posts them on the Facebook page for his guest house and inn, The Hudson Milliner, with messages like this: "This cool cat lives at Animalkind in Hudson NY, presently. 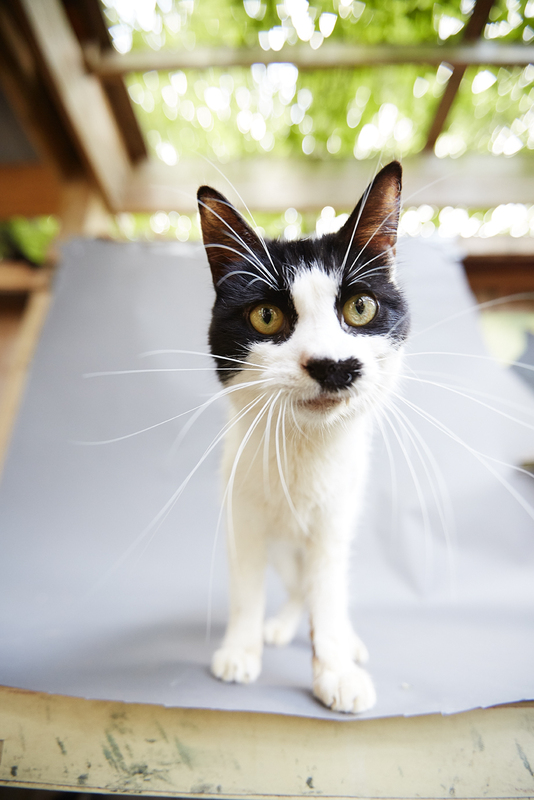 He could live with you if you're looking for a furry friend to adopt." Despite the fact that the Common Council voted unanimously in May not to increase the fee for removing the boot from $110 to $150, the boot is back. The practice of booting cars for outstanding parking fines had been suspended by Mayor Tiffany Martin Hamilton in March 2016 because some cars that were booted ended up also getting towed because fines could not be paid within 24 hours on the weekend. Now that outstanding parking fines can be paid at the police station, which is open 24/7, it was decided the practice of booting cars should resume. But after two years, the towing companies that had been providing the service wanted more money to come back to Hudson. Apparently, the money issue has now been resolved, because yesterday the Hudson Police Department announced on its Facebook page that the boot has returned. Citizens should be made aware that enforcement of Local Law No. 3 of 2011, regarding the booting of vehicles will resume immediately. Booting had been temporarily suspended while the City reviewed policies regarding booting. Any motor vehicle which has three or more [parking] tickets outstanding in excess of 45 days may have a boot installed upon it. In addition to the outstanding tickets, the car owner shall pay a boot removal fee of $110 dollars plus tax. If your vehicle is booted, you have 24 hours to pay all fines to the ticket clerk at the parking bureau. The tow company that installed the boot will return after 24 hours to tow the vehicle and you will be subject to additional towing and storage charges. The announcement on the HPD Facebook page doesn't indicate this, but presumably if the 24 hours in which you must pay your outstanding fines happens on the weekend when the Parking Bureau, which is located in City Hall, is closed, you can pay your outstanding fines, required to free your car from the boot, at the Police and Courts Building, 701 Union Street. Whether or not that's the case, the goal is to avoid the boot, so if you have unpaid parking tickets, you may want to take care of them now. You can do it online at www.parkingticketpayment.com/hudsonny/. There's a fee, but you can do it at your convenience, and you'll know it's done. 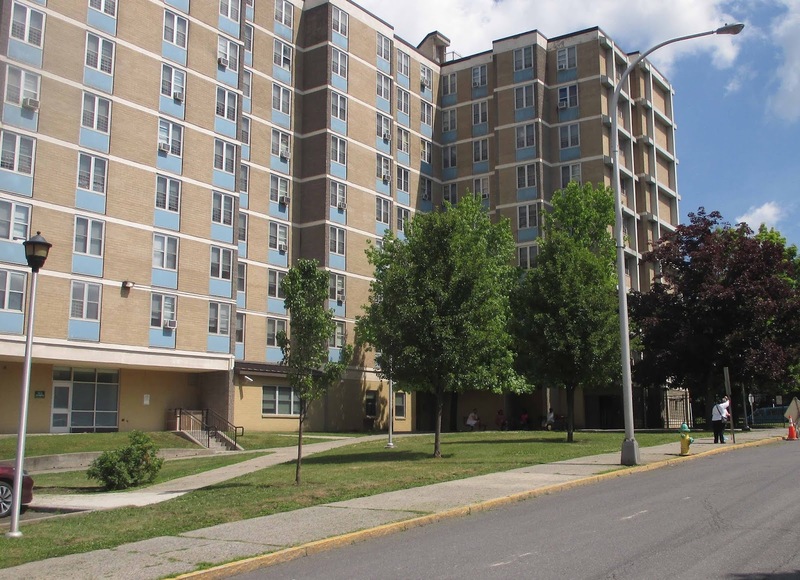 The public housing project known as Bliss Towers is a perennial cause of contention in Hudson. There have been allegations that conditions in the building "have deteriorated well beyond livable." Evidence has emerged about past mismanagement. 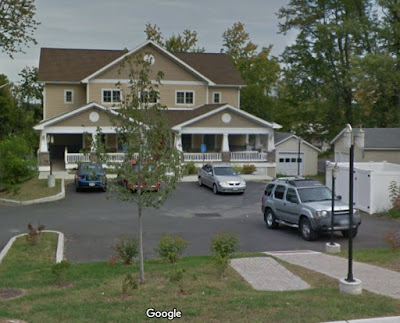 There have been calls to "do away with" the Hudson Housing Authority Board of Commissions and suggestions that current HHA director Timothy Mattice isn't doing enough to address the issues. Then there's the persistent conversation about razing all or part of the building in favor of pursuing some new model for subsidized public housing. Meanwhile, things are happening at Bliss Towers that counter all the bad publicity. The fence surrounding the property has come down, and a plan for new landscaping is being developed by three members of the Conservation Advisory Council-- Carol Smillie, Holly Gardner, and Elsa Leviseur--with input from building residents. Today, Friday, June 29, there is to be an Open House at Bliss Towers to introduce residents to available community services and people in the community to the building. Representatives from about a dozen agencies and organizations, from the Department of Social Services to the Hudson Farmers Market, will be present, and one of the newly renovated apartments--one of forty that have recently been completely rehabilitated--will be open so people can see the work now being done in the building. The event is from 4 to 7 p.m. today at 41 North Second Street. Last night, Gossips brought attention to a typo in the new street sign at State and North Third streets. This morning a new sign appeared, with the spelling of the ordinal suffix corrected. Thank you, Department of Public Works. And thanks to David Andersson, who provided the information and the pictures. The street sign at the corner of North Third and State streets, which was knocked down a while back, has recently been replaced. It seems some things in Hudson haven't changed since Stephen Bergman was growing up here in the 1950s. Writing as Samuel Shem, Bergman characterized the thinly fictionalized Hudson that is the setting of his 2008 novel The Spirit of the Place as a "town of breakage." In this case, we might call it more appropriately a town of "mistakage." 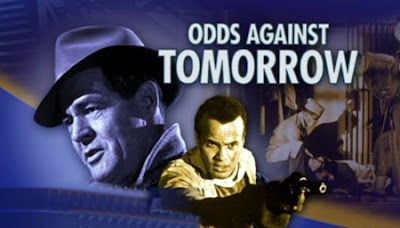 Today at 6 p.m., there is a screening at the Hudson Area Library of Odds Against Tomorrow, the memorable 1959 film noir that features Hudson as its central setting. 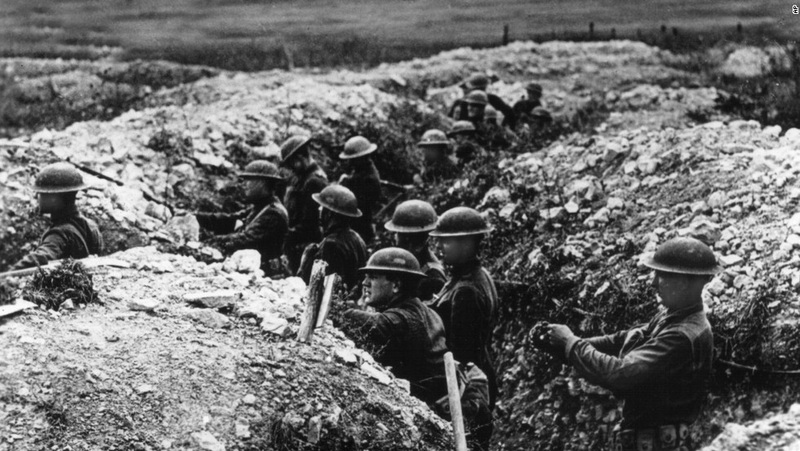 The event is part of the History Room's Local History Speaker Series and features, following the screening of the film (which runs for about an hour and forty minutes), a discussion with documentary film maker David McDonald. McDonald has this to say about the film and how became interested in it: "Apparently, tons of people in the town of Hudson had served as extras in the movie or played a part in the production . . . so I got it into my head to do a short video about [people's] memories of the event. To do so, I thought I should sit through the old movie, and when I did so, I was gobsmacked. That movie, all about the price of intolerance, was a relevant for today's world as it had been in 1959. I was hooked." The trailer for McDonald's video--a "film-about-a film"--will be shown after the movie. The screening is open to the public. A donation is suggested. Snacks and refreshments will be available at a cash bar. The library is located at 51 North Fifth Street. 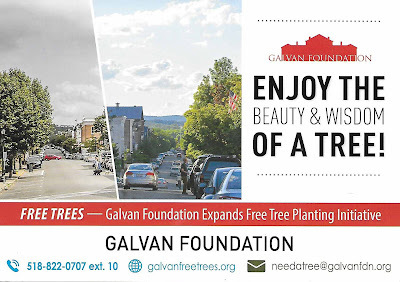 Earlier this week, a flyer arrived in the mail from the Galvan Foundation, announcing its free tree planting initiative. The homeowners of Hudson are being invited to "ENJOY THE BEAUTY & WISDOM OF A TREE!" 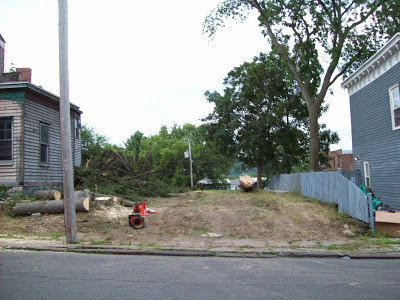 by the foundation whose modus operandi is to fell all the trees on the property it acquires. In Sunday's post about the public hearing held by the Historic Preservation Commission, it was noted that no new historic districts have been created since 2006. A recent comment by an alderman that her constituents were concerned "historic preservation was coming to them," as if having your neighborhood become a historic district were more dreaded than an infestation of Formosan termites or emerald ash borers, gives a pretty good indication of why creating new historic districts is not a task the HPC or any other group is eager to take on. Upper Columbia Street is a sad reminder of what can and does happen in areas that are not historic districts. In August 2013, the house at 900 Columbia Street was demolished, despite efforts from the community to save it and the false promise from the Galvan Foundation to move it to a location on Union Street. The state historic preservation office was called upon for help. The house was determined to be a very early 19th-century house, eligible for listing in the National Register of Historic Place, but because it was not in a locally designated historic district, there was nothing to stop its being "disassembled." The building that replaced it is of a kind of pseudo-Arts and Crafts design, totally out of character with the neighborhood, and the parking lot, positioned in front of the building, interrupts the street wall and looks suburban in a very urban setting. 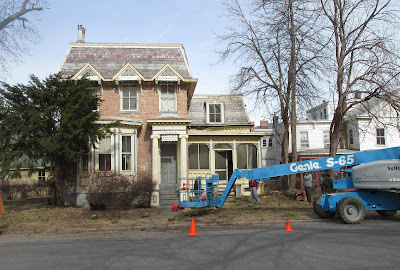 Now the house next door, at 886 Columbia Street, is undergoing its own transformation. 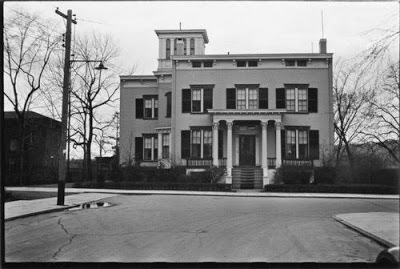 Originally known as the Dinehart mansion, the house was built as a single family residence around 1910. 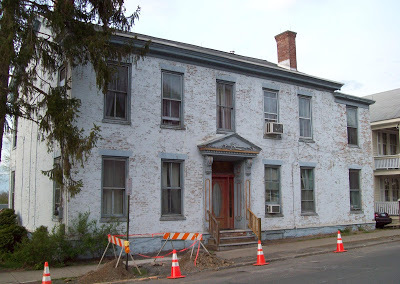 The house's fate was probably determined sixty years ago, when it was purchased in 1958 by the Rip Van Winkle Foundation to expand its clinic. In the intervening years, the house has had a variety of uses, among them a funeral home, but it never returned to being a residence. Now the house is being converted into six medical office suites. 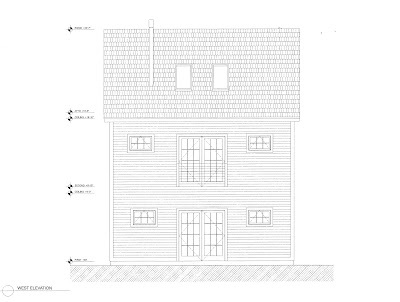 Gossips followed the site plan review for this house by the Planning Board and reported what was said about the changes being proposed--those that were in the purview of the Planning Board: adding an elevator at the back of the building, expanding the parking lot, re-glazing the brick blue-gray. 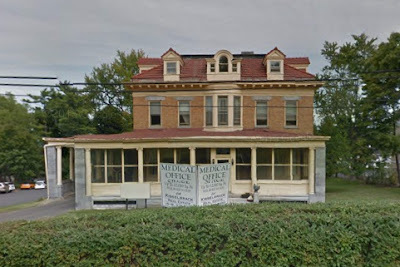 Nothing was said about enclosing the front porch, which was probably originally an open veranda, was enclosed with windows sometime in the last century, and extended to create a porte cochere probably during the house's stint as a funeral home. Since the project got its site plan approval, I've been watching the progress of the house's transformation into medical suites. 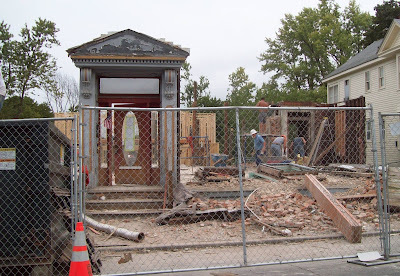 When the columns that supported the roof of the porch were removed, I foolishly thought they were being removed for restoration and tried to ignore the fact that they'd been replaced by pillars of cement blocks. Even when great sheets of plywood appeared, I stuck to my pipe dream, but I was forced to abandon it when the ZIP wall sheathing appeared. We as a community may mourn the loss of great houses and regret the 20th-century transformation of others . . .
but without the protection of the City's historic preservation ordinance, which only applies to buildings within locally designated historic districts, the demolition and re-imagining of Hudson's historic architecture can continue unabated, and it does. 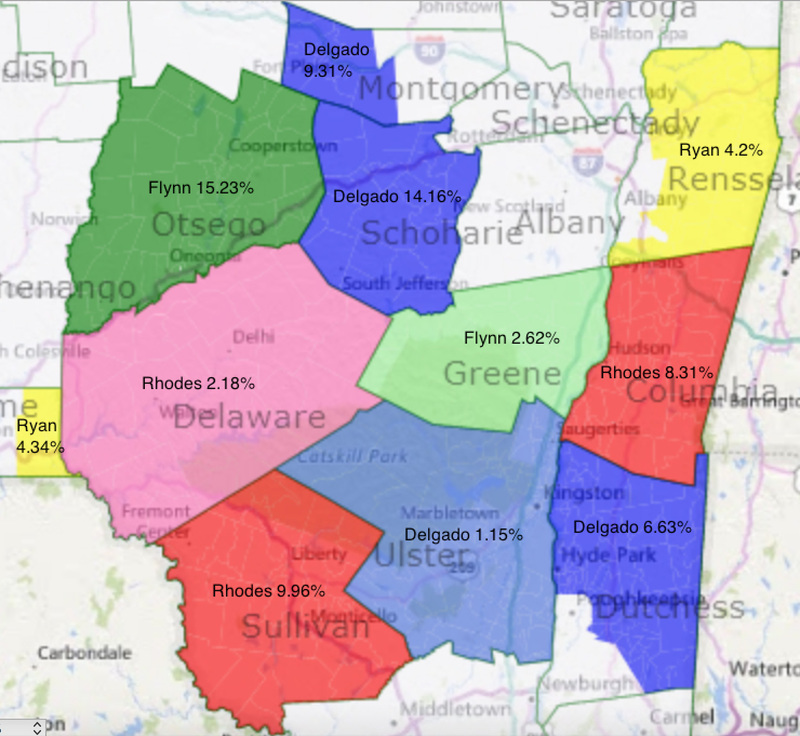 A Gossips reader couldn't find a map that showed the county-by-county results of yesterday's Democratic primary in New York's 19th Congressional district, so he created one himself and gave Gossips permission to share it. The source of the data is the New York State Board of Elections, which is now reporting results from 436 of the 458 election districts. The percentages given indicate the percentage lead of the first place winner in each county over the candidate coming in second. Sam Pratt comments on the outcome of yesterday's primary: "Instant takeaways from the NY-19 Democratic primary." Click here to view the election results being reported by the New York Times. The New York State Board of Elections is now reporting the following results from 385 of 458 election districts in CD19: Brian Flynn 4,320; Erin Collier 1,493; Gareth Rhodes 5,708; Pat Ryan 5,465; Antonio Delgado 7,022; Jeff Beals 4,331; Dave Clegg 3,763. The unofficial election night results now being reported by the Columbia County Board of Elections are as follows: Brian Flynn 505; Erin Collier 157; Gareth Rhodes 1,156; Pat Ryan 639; Antonio Delgado 840; Jeff Beals 478; Dave Clegg 195. Of course, that's just Columbia County. There are ten other counties in New York's 19th Congressional District. Since last night, Gossips hasn't had a chance to report on the Common Council Police Committee meeting, but there is no need. Dan Udell's video of the meeting is now available on YouTube and can be viewed by clicking here. 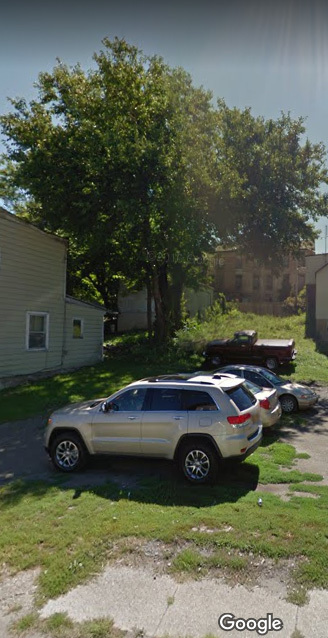 Strapped for cash, the Hudson Community Development & Planning Agency (HCDPA) is selling off some of the vacant property it owns in Hudson, mostly in the Second Ward. 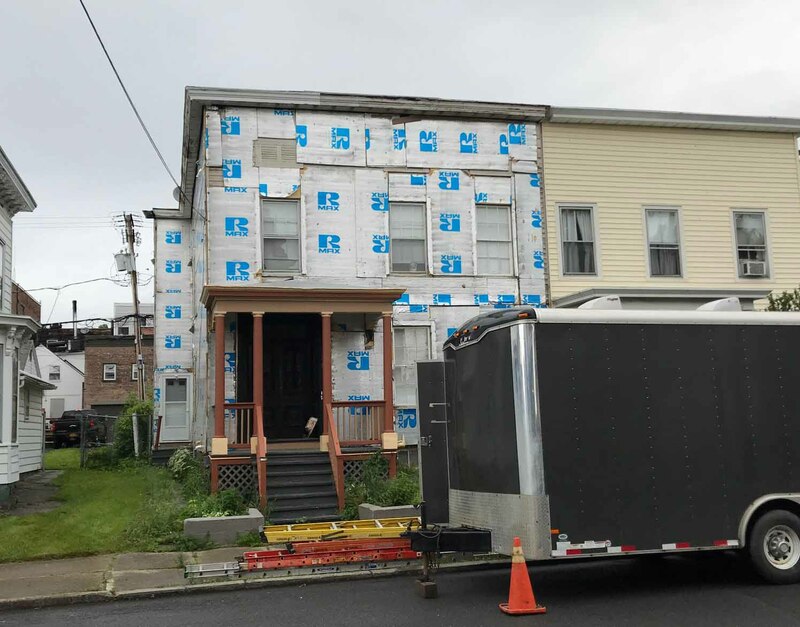 The first parcel offered for sale is a relatively narrow strip of land between 209-211 Columbia Street and 215 Columbia Street that runs from Columbia Street through to Prison Alley. The parcel is being sold by sealed bid. Bids on the property will be accepted by HCDPA at 1 North Front Street until 2 p.m. on Thursday, July 26, after which time "the bids will be opened and publicly read aloud at a special meeting of HCDPA" to take place at 1 North Front Street. The bid package, which gives complete information about the parcel, provides directions for submitting a bid, indicates the minimum bid, and includes the form for submitting a bid, can be found here. 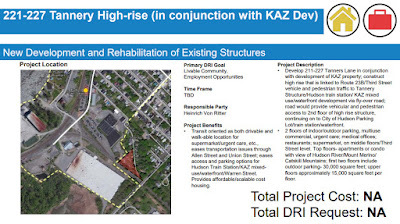 At the special meeting held by Hudson Development Corporation (HDC) on June 7 about the redevelopment of the Kaz site, Mark Morgan-Perez cautioned against issuing a new RFP (request for proposals), warning that it "could actually scare away developers." The idea being that this might seem to be a project that would never actually happen. I was reminded of this when I read recently about a three-day design workshop that took place in Troy last week, hosted by the City and conducted by River Street Planning and Development, to gather ideas from residents and business owners about how to redevelopment One Monument Square. 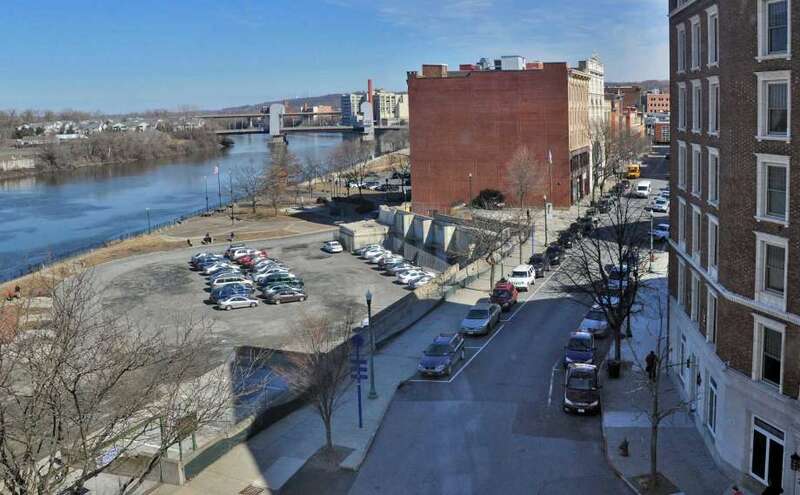 What struck me was not that Troy was taking a community-driven approach to planning for this critical 1.18 acres on its waterfront but that this would be Troy's fifth attempt to come up with an acceptable plan for redeveloping the site. We're only stalled on our second attempt with the Kaz site. The first time around, in 2016, Sustainable Community Associates (SCA) was the chosen developer, and the plan was to create a mixed-use development that included residential, retail, co-working office and live/work spaces, "designed to LEED Gold standards, utilizing geothermal or other high-efficient heating, and maximizing passive solar heating and natural ventilation." Early in 2017, despite a visit from Chuck Schumer in December 2016 to announce his help and support, that plan was put on hold and ultimately abandoned. A new RFP was issued in early October 2017, and by the end of November 2017, proposals had been received from four developers: SCA (the same proposal submitted before), Redburn Development, Kearney Realty & Development Group, and Bonacio Construction. SCA withdrew its proposal early on, and since November 2017, the HDC Board has been vetting the remaining three developers, assessing their financial security and viability and visiting projects they have completed in other cities. This vetting process, despite a show of little or no confidence from the community, is apparently continuing. HDC has tried to reassure the community that the selection of a developer will be followed by six months of community-driven planning before a final plan is developed, but people aren't feeling reassured. They want to see up front renderings of what the buildings will actually look like. They want to feel comfortable that the development of this site won't have a negative, character-altering impact on the city. HDC seems confident that the DRI (Downtown Revitalization Initiative) process produced enough public input to inform the development of this site, but members of the community clearly think otherwise. Perhaps we, like Troy, need a three-day planning workshop to create a plan that will then be presented to developers instead of issuing an RFP that defines "development goals" and leaves it to the developer to come up with the plan. The front page of the Columbia Republican for June 25, 1918, includes several items of interest: a report about a patriotic meeting at The Playhouse, during which all twelve reels of "the famous Donald Thompson films were thrown on the screen"; the account of a patriotic meeting in the Public Square, where the speakers "addressed the big audience from an automobile," urging thrift and asserting that "the waste of this country in one year would feed France for the same period"; and an article predicting the defeat of Germany was in sight and quoting Lloyd George as saying, "The number of Americans who have come since March is sufficient to satisfy the allies and ultimately defeat Germany." But the item that reveals most about the local impact of the war at the beginning of that summer is this one, which outlines a plan to ensure the crops of the nearby farms would be harvested. Of the men attending the meeting, A. Frank Bogardus was a principal in Downing & Bogardus, wholesale and retail dealers in flour, feed, hay, and grain--"the largest business of its kind in the city," located in Franklin Square; Charles S. Rogers owned "the oldest and largest wholesale grocery house in Hudson," located at 745 Columbia Street; C. H. Evans was, with his brother Robert, the owner of C. H. Evans & Sons Brewery; Dr. Yeisley was the minister of the First Presbyterian Church. The research at Ancestry.com indicates that L. C. Bashford may have been a farmer from Chatham. On Monday, June 25, there are two Common Council committee meetings. The Fire Committee meets at 5:30 p.m. There is no agenda available for this meeting, but at the Common Council meeting on Tuesday, June 19, Dominic Merante (Fifth Ward), who chairs the committee, intimated that requests for additional funding for the Fire Department were in the offing. The meeting will be an opportunity to learn more about this. The Police Committee meets at 6:00 p.m. 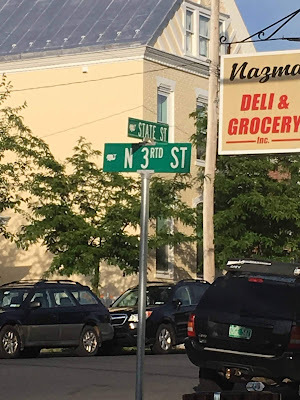 It is expected that Fourth Ward supervisor Linda Mussmann and others will be there to protest the deployment of the Shared Services Response Team in Hudson on June 5, which Mussmann has characterized as "a militarized raid on Hudson." The meeting is expected to be a continuation of the conversation started at the informal Common Council meeting on June 11 and pursued at the Board of Supervisors Public Safety Committee on June 20. 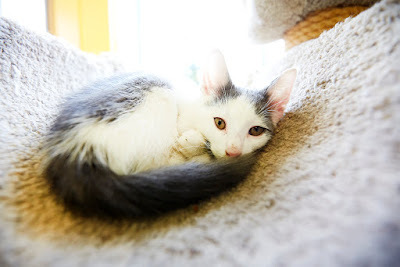 On Tuesday, June 26, there are two meetings of interest, both of which Gossips will miss because it is also the day of the Democratic Congressional primary, and I will be spending the day at the polls. 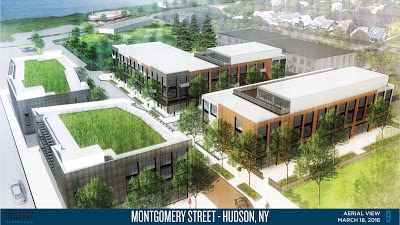 At 12 noon, the Hudson Development Committee (HDC) board meets at 1 North Front Street. There are likely to be updates on the acquisition of property from CSX to give the Kaz site access to South Front Street and the financial review of the three developers that have submitted proposals for the Kaz site, and possibly the announcement of new board members and a progress report from the search committee tasked with finding a replacement for executive director Sheena Salvino, who will be leaving in early August. At 5:30 p.m., the Common Council Finance Committee will meet. There may be other things on the agenda, but the main business will be parceling out $20,000 to worthy festivals and events. This task used to be done in May by the Arts, Entertainment & Tourism Committee, but since that committee no longer exists, it has fallen to the Finance Committee, and it's being done at the end of June, after two of Hudson's major events—the Flag Day Parade and the OutHudson Pride Parade—have already happened. In past years, these two events have, between them, gotten more than a quarter of the money, so it will be interesting to see if they get any money this year for expenses already incurred. On Wednesday, June 27, there are once again two meetings, back to back. At 6 p.m., there is a special meeting of the Common Council to discuss the budget amendment requested by the Youth Department. At 6:15 p.m., the Legal Committee is scheduled to meet, so either all the problems and questions surrounding the request for an additional $50,751.75 for the Youth Department have been worked out and answered behind the scenes and the special meeting will be over in fifteen minutes, or the Legal Committee meeting won't start until the special meeting of the Council is over. Stewart's Shops and its request for a zoning amendment to accommodate a desired expansion will likely once again to be on the agenda. On Thursday, June 28, at 5:30 p.m., the Tourism Board, will meet for the first time. 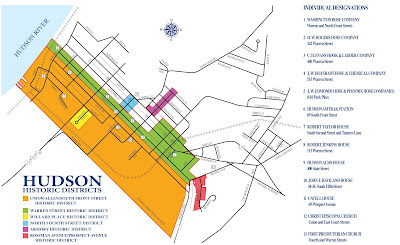 The law that established the 4 percent lodging tax in Hudson also created the Tourism Board, "empowered to take all reasonable steps it determines desirable, necessary and proper to market the City of Hudson as a destination for overnight and daytrip visitors by making use of the funds set aside by the City Treasurer." Those funds are a percentage of the revenue from the lodging tax: 50 percent of the first $250,000; 25 percent of the second $250,000; 10 percent of everything beyond $500,000, not to exceed $250,ooo a year. Alderman Rich Volo (Fourth Ward) chairs the board, which is made up of mayoral and Council appointees: Ted Gramkow, Chuck Rosenthal, Tambra Dillon, Kristen Keck, Jeff Hunt, David Brown, Ellen Thurston, and Jamie Smith Quinn. 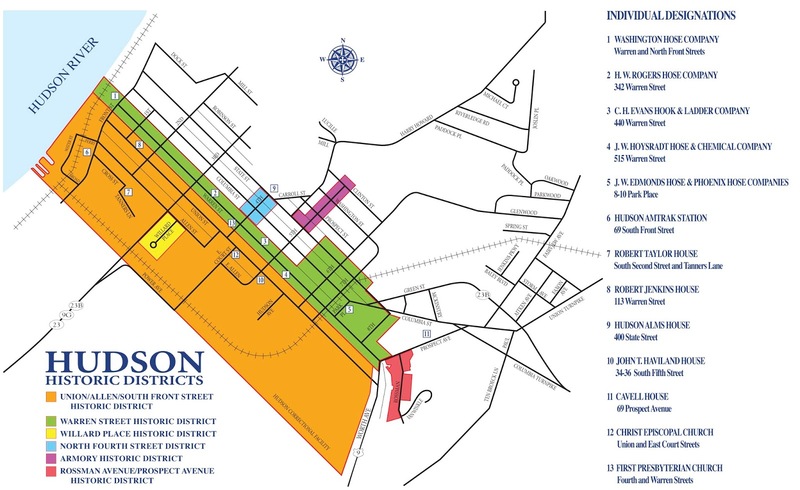 On Friday at 5 p.m., the Historic Preservation Commission held a public hearing to receive comment on the proposal to amend the southern and western boundaries of the Union-Allen-South Front Street Historic District, Hudson's largest locally designated historic district, encompassing most of the city south of Warren Street. (It's the orange area on the map below.) The reason for the amendment is a discrepancy between the intent of the members of the HPC who did the inventory for the district and the actual description of the district that accompanied the resolution that created the district passed by the Common Council in 2006. 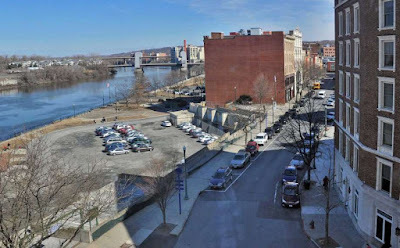 The intent was that the district extend to the river on the west and Power Avenue to the south, to include such significant historic properties as the Robert Taylor House, the train station, the Dunn building, and Basilica Hudson. The HPC has been discussing the discrepancy on and off for years. 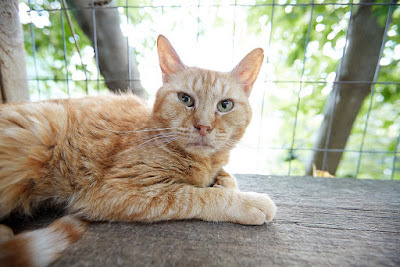 It caused a problem back in 2012, when the Galvan Initiatives Foundation wanted to move the 1790 home of the tanner Robert Taylor from its location at the head of Tanners Lane to a site on Union Street. It was argued at the time by Galvan that the house was not in a historic district and nothing in the documentation for its individual designation specifically addressed the historic significance of its location. What has prompted the HPC to take action at this time is the imminent development of the Dunn building and the redevelopment of the Kaz site. 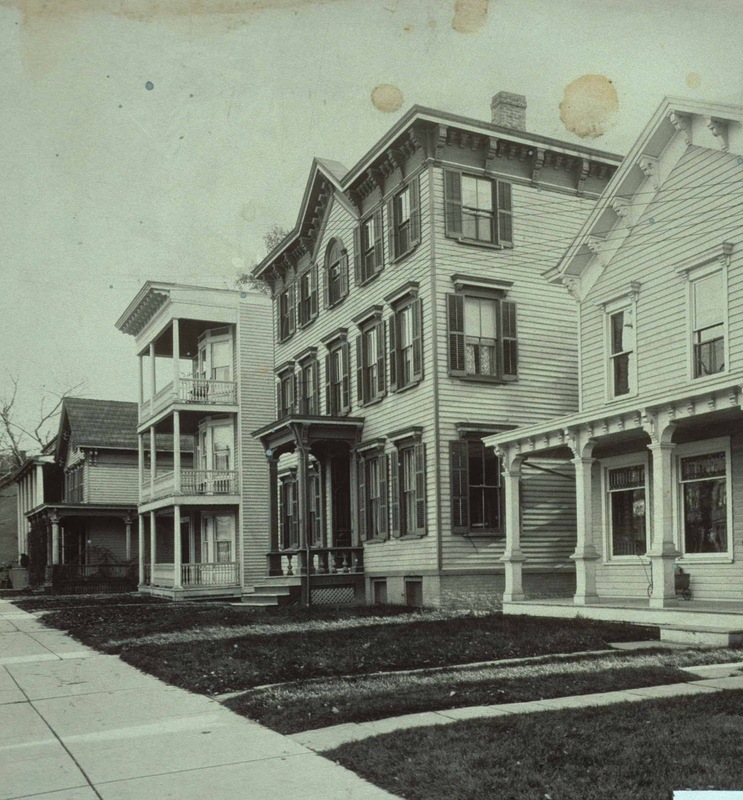 The original historic preservation ordinance, adopted in 2003, gave the HPC the power to designate individual properties and neighborhoods as landmarks and historic districts, a status that protected the historic character of buildings and neighborhoods from inappropriate alterations and incompatible development. When the HPC started exercising this power, however, the law was suspended by then mayor Rick Scalera and rewritten to require the Common Council to approve all historic designations. The amended law went into effect in June 2005. 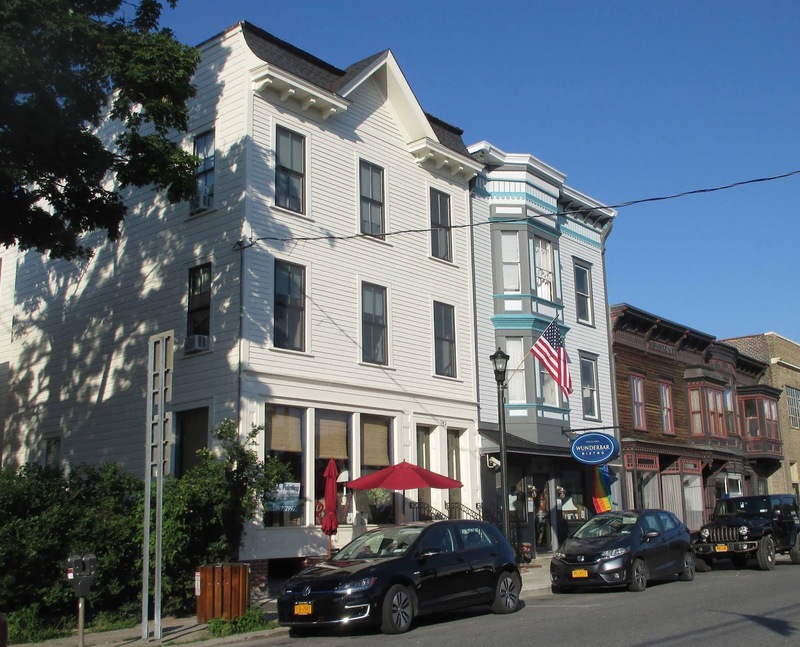 All the historic districts that currently exist were created during a two-year window of time—2006-2007—when supporters of historic preservation had enough votes on the Common Council to pass the resolutions creating the districts. Since that time, no new historic districts have been created. A resolution to amend the south and west borders of the Union-Allen-South Front Street Historic District came before the Common Council in April, but it was tabled by Council president Tom DePietro, who alleged that the HPC had not prepared the resolution and the accompanying documents properly and had not notified some of the property owners affected by the boundary amendment. The problem stemmed from an error in the map that accompanied the resolution, showing the new boundaries. The map used Worth Avenue as the eastern boundary, setting off a wave of rumors that the HPC was trying to pull the properties on Worth Avenue into the district. So the HPC started over: a new map, a new round of written notification (the first round had been letters instead of the prescribed post cards), a new public hearing, held at 5 p.m. instead of at 10 a.m., which is the HPC's usual meeting time, to convenience the architects and contractors who typically represent the building owners in presenting applications. Despite the efforts, the public hearing on Friday was poorly attended. In addition to Gossips and DePietro, there were six people in the audience. After an introduction by Phil Forman, chair of the HPC, in which he tried to dispel some of the misperceptions about the HPC—"We don't opine on paint colors; we're not involved in everyday repairs; we don't opine on like for like changes; we don't dictate building use"—and give assurance that the HPC exists "to protect what is" and that historic designation was "a bit of an insurance policy for current homeowners from inappropriate demolition and the construction of new buildings in your face, blocking the view," comments from the public were invited. Forman had even provided comment sheets and pens for people who wanted to share their thoughts but were reluctant to speak in a public meeting. The first to speak was Peter Tenerowicz, who didn't make a comment but asked a question on behalf of the Hudson Power Boat Association. He wanted to know if historic designation would interfere with repairs to the building or prohibit change of use. Forman told him that only demolition or significant changes to the exterior of the building would fall into the purview of the HPC. The next person to comment was Heinrich von Ritter, who owns vacant property at the end of Tanners Lane. He complained, "I've been trying to sell my property, and all I get is blackballed." When last Gossips checked, in February 2016, von Ritter was asking $6 million for the property. He proposed a project in the DRI process to be called "Tannery High Rise," which was rejected because it was not a stand-alone project but sought to be part of the Kaz redevelopment project. The next person to comment was Cross Street resident Ed Csukas. His statement was simple: "Historic designation can't come fast enough as far as I'm concerned." He wanted to know if there was anything residents could do to make it happen, and Forman answered, "Talk to your aldermen. They them you are a constituent, and you think this is a benefit." Fellow Cross Street resident Teresa Meza wondered how things were moving forward "with that mysterious area behind Cross Street," referring presumably to the Kaz site. Sophie Henderson, deputy director of Basilica Hudson, presented a letter from Basilica founders Melissa Auf der Maur and Tony Stone declaring their full support of the boundary amendment and the protections it provides. Tenerowicz then asked about the time frame. 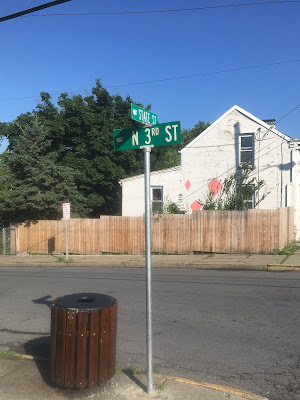 Forman first referred the question to DePietro, who was seated beside Tenerowicz, but then said that the HPC would vote on pursuing the proposal at its next meeting on July 13, and it would be another month and possibly two before the proposal would be taken up by the Common Council. In the press release that announced the memorable exhibition at the Hudson Opera Hall in December 2016, No Parking: The Alleys and Garages of Hudson, the late Bill Hellermann, whose photographs, along with those of Lisa Durfee and Peter Spear, were featured in that show, is quoted as saying, "I happened to notice in the summer of 1998 that gentrification had unmistakably taken off in Hudson. However, by contrast, I found that the garages were often more visually interesting than the buildings on the main thoroughfares. They have an accidental beauty." 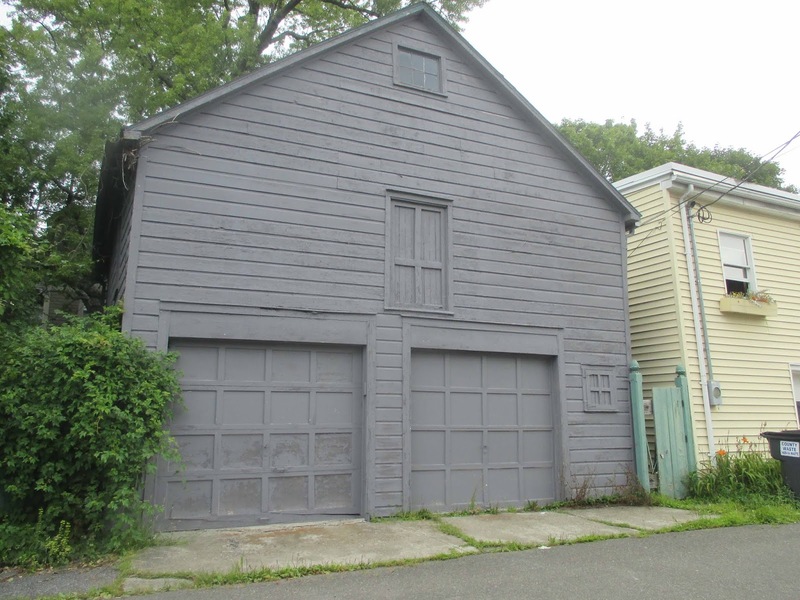 Twenty years later, as the gentrification of Hudson continues, the "accidental beauty" of those garages and alley buildings is in danger. The fate of one such building, an early 20th-century garage on Partition Street (not officially an alley but perceived as one), behind 439 Union Street, came up in discussion toward the end of the Historic Preservation Committee meeting this morning. 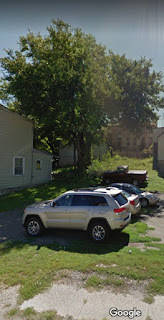 In August 2017, the proposal to demolish this pre-World War II garage and replace it with a new building came before the HPC. The building wasn't structurally unsound. It was perfectly fit for its intended purpose as a garage and storage, but the owners of the property wanted to use it for human habitation, which meant it would need a new foundation, and code enforcement officer Craig Haigh predicted, "This building will fall apart if they have to lift it and put it on a new foundation." 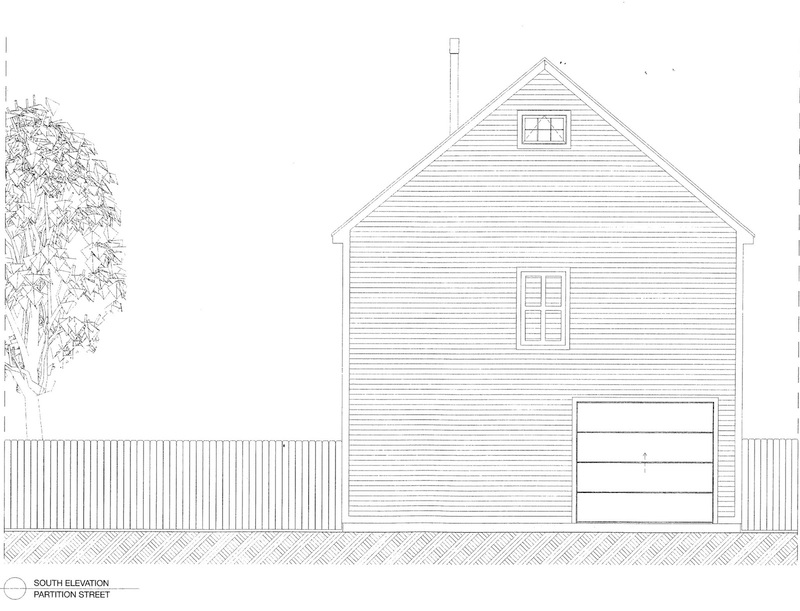 The plan to demolish the original garage and build a "new, similar building" on its footprint first came before the HPC on August 11, 2017. HPC member Miranda Barry described what was first proposed as "a new, generic contemporary building." 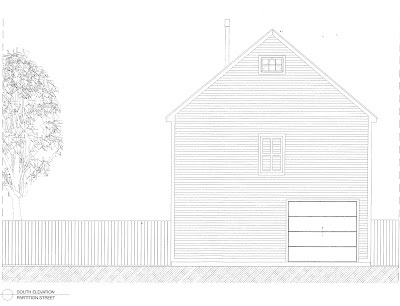 The applicant came back with another design, meant to replicate the existing building, and the HPC granted a certificate of appropriateness, persuaded that the new design would preserve the integrity and character of the streetscape. This morning, after the business before the HPC was concluded, Barry explained that she was almost late for the meeting because on her way to City Hall, she was detained by someone who wanted to complain about the "massive" new building on Partition Street. In the discussion that ensued, questions were raised about whether it had actually been built on the footprint of the original building and if the height exceeded what had been approved. 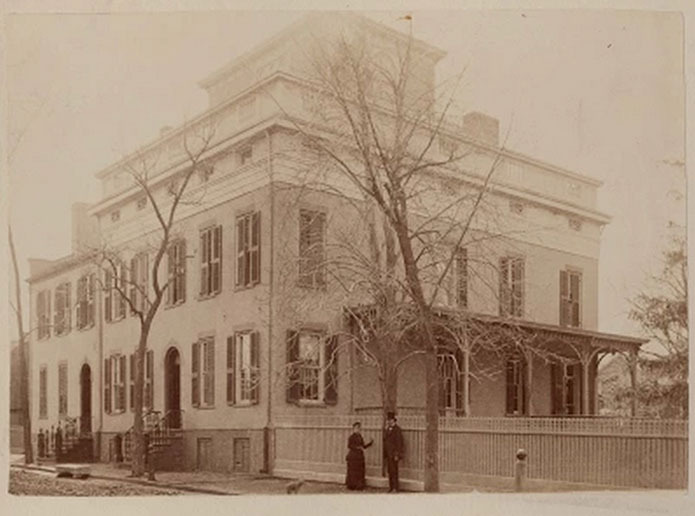 After the meeting, Gossips went to take a look at the new building and concluded that the building is probably exactly what was approved, with the exception of the window on the second floor of the south facade, which appears to be much taller and narrower than what appeared in the elevation drawing. 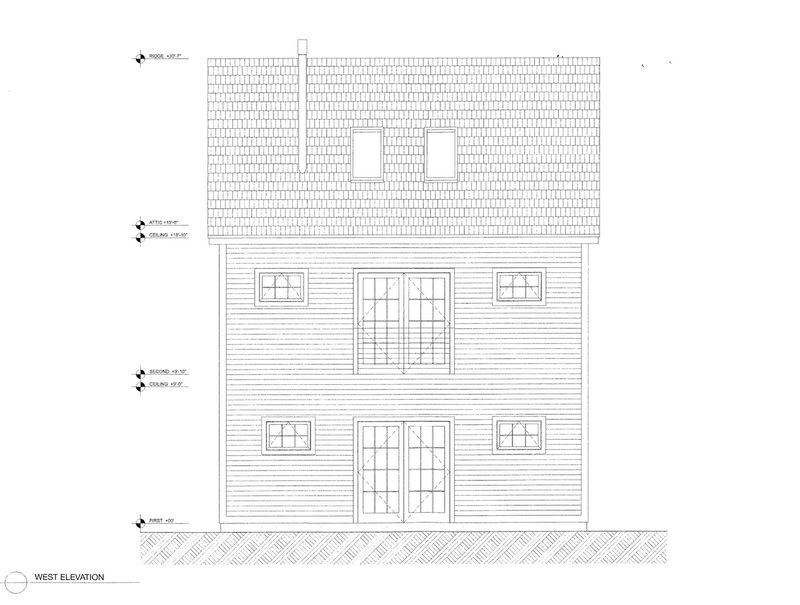 The building is in fact taller than the original and made to appear even taller by what appears to be a steeper pitch of the gable roof. What is most striking, though, is that the new building completely fails to replicate the character of the original. Maybe fences and plantings will help--softening the stark newness of the structure--but there is no doubt that the character of this stretch of Partition Street has been significantly altered.